KCNAKim’s new ride is a slap in the face for the US. 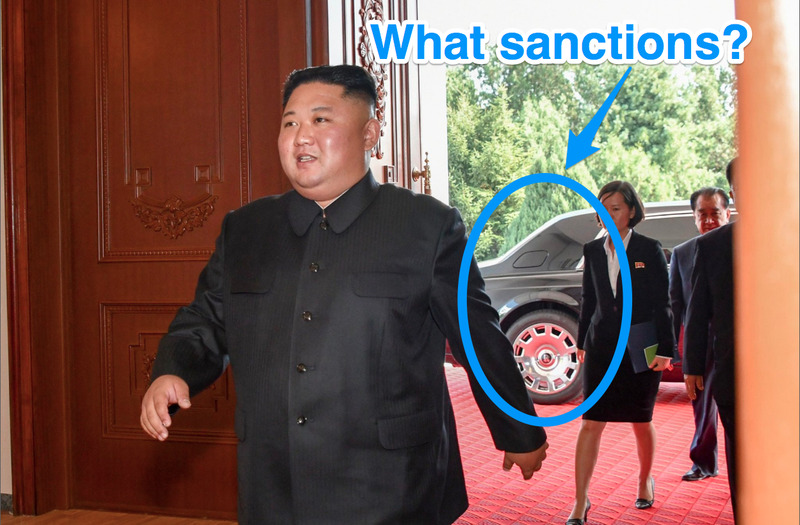 North Korean leader Kim Jong Un has again made a mockery of the US’s policy towards Pyongyang when meeting with Secretary of State Mike Pompeo, this time with a new Rolls Royce Phantom. The US has tried everything in its power to restrict the flow of luxury goods to North Korea, but Kim showed the Trump administration they failed. Last time Pompeo went to North Korea, Kim ditched him and instead toured a potato farm. North Korean leader Kim Jong Un has again made a mockery of the US policy towards Pyongyang when meeting with Secretary of State Mike Pompeo, this time in decidedly flashy style. When Pompeo arrived in North Korea in July to follow up with Kim after President Donald Trump’s historic summit in Singapore, Kim outright ditched the US’s top diplomat. Pompeo was reportedly promised a meeting with Kim in July, but no such meeting took place. Instead, photos showed Kim touring a potato farm. This time, when Pompeo visited in early October, Kim did show up and the two appeared friendly as the leader arrived and shook Pompeo’s hand. But Kim had just stepped out of a new looking Rolls Royce Phantom. The large “R” emblem on the large, chrome rim struck an unmistakable image before Pompeo. Rolls Royce, of course, is a British luxury car maker, and North Korea remains under heavy US sanctions that strictly forbid the sale of luxury goods to the country. 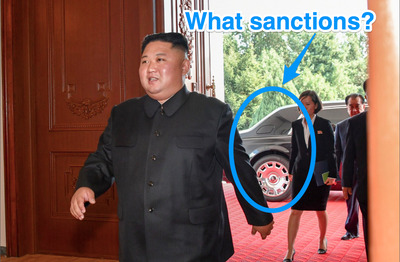 During the summit in June, Kim was seen in a Mercedes-Maybach Pullman Guard armoured limousine flanked by security running alongside on foot. The Trump administration maintains it’s made good progress on getting North Korea to denuclearize despite no verifiable actions towards this taking place. A key point in the administration’s defence of its North Korea diplomacy is that sanctions remain in place and that the Kim regime continues demilitarization talks with South Korea. But increasingly North Korean ships have been spotted at foreign harbours, which the UN sanctions forbid. China and Russia have reportedly increased trade with the country since the summit, and now South Korea has started providing more aid and discussing removing sanctions. By showing up in a new Rolls Royce Kim managed to mock Pompeo and the Trump administration’s attempts to isolate North Korea.